← WTF Weather Channel (weather.com) HairCast? Please. The RipCurl GPS watch is designed for surfers but it also works great for Kitesurfing. 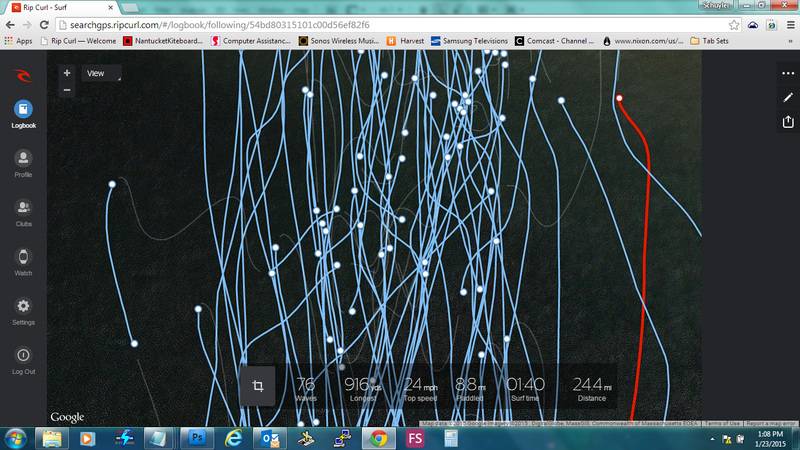 The GPS tracking is surprisingly accurate and really fun to dig into after a session. The entire system is comprised of the GPS watch and a cool web portal which lets you document and revisit your sessions. The watch syncs to your Ios device via bluetooth and you plug it into your laptop to charge it. It can also sync your sessions over the wire to your laptop. Its battery says it has 10 hours of juice when GPS tracking is turned on. The question isn’t really is it cool and functional technology? It is. 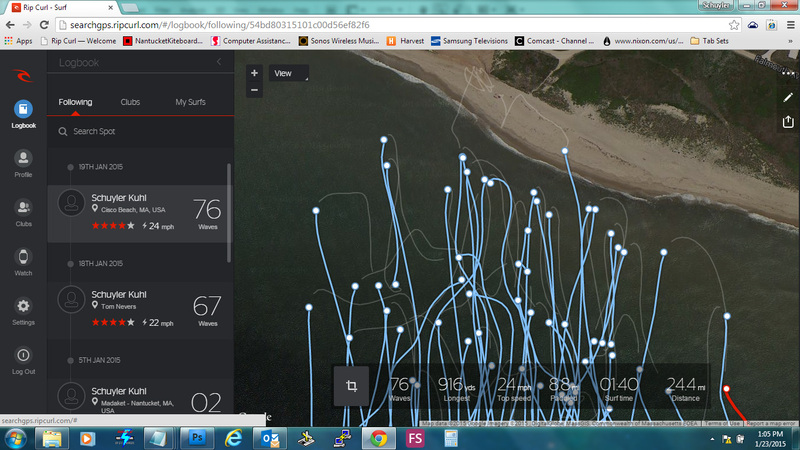 Its how well does it work for tracking Kitesurfing sessions when it is 100% designed for surfing. The answer is not perfectly, but not too badly either. 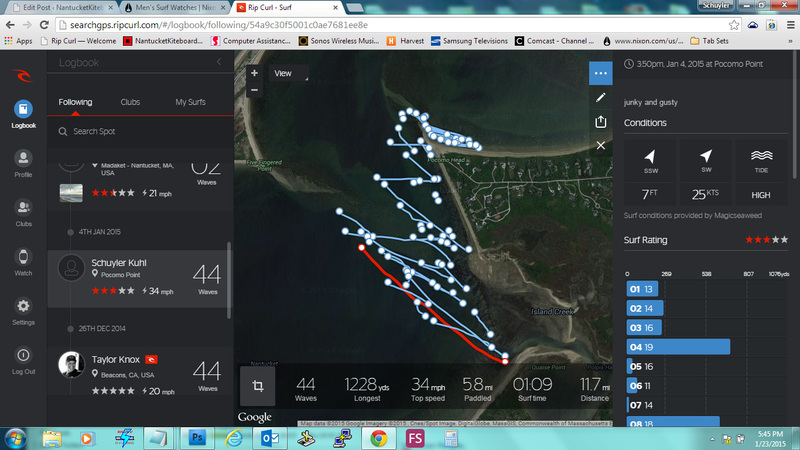 When zoomed out all the way your runs blob together, unless you head downwind. Basically the RipCurl GPS watch is a slightly chunkier than usual tide watch. Its a pretty good tide watch. Tide info is clear and easy to understand. It might not be as good as the Nixon Super Tide, but it gets the job done. The coolest thing about the tide on this watch is that it automatically sets for the closest tide setting via gps. So it automates the whole setting process. Which is nice. Then when you are about to sail you turn on the “Surf Now” feature of the watch and it syncs up with GPS. Then for the duration of your session it records your gps data. 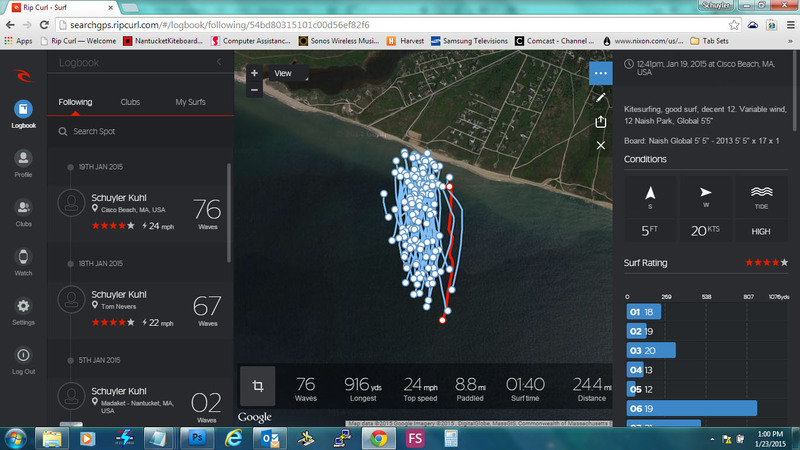 At the end of your session you stop the “surf” on the watch and it tells you the number of waves you caught, top speed, duration of surf, total distance traveled and gps location of the beach you sailed. Later, when you sync to your computer or phone you get all the gps data displayed on a map, its interactive and you also get all of the other condition detail provided by MagicSeeweed.com regarding swell, wind and temperature. Its really cool. When zoomed in all the way you can't see an entire run in one screen but when you show "paddling" you can see basically every turn you made. All of these images are from a good session at Cisco last weekend. The first image shows the zoomed out view. Its what the system calls your “logbook” and shows you a list of your sessions and the details that are recorded or entered by you about that session. When you zoom in closer all of your runs go from being one big blue blob to individual lines that you can follow. The algorithm for evaluating your number of “waves” seems to work based on changes in your speed and acceleration. The wave count isn’t accurate for kitesurfing but I have found that the more intense sessions tend to get a higher wave count by the algorithm. So usually more “waves” does indicate a better session. But on the Map when you show “Paddling” you can basically follow every turn you made over the entire course of your session. The accuracy and detail are impressive. You can see the accuracy here. You can see on the beach the spot that I launched and the spot I landed. It would be cool if the developers at RipCurl eventually allow for a certain amount of variation for different sports using this product. If there is a way for it to show highest altitude or some way to track jumps that would be a great feature for kitesurfers. This session at Pocomo was a good test for the accuracy of the gps and the shows how cool the top speed measurement is. This entry was posted in Equipment Notes, Lessons Learned, News and Info, Sessions & Conditions. Bookmark the permalink.